The Mystery Spot must be sending secret rock star pheremones out into the mountains. 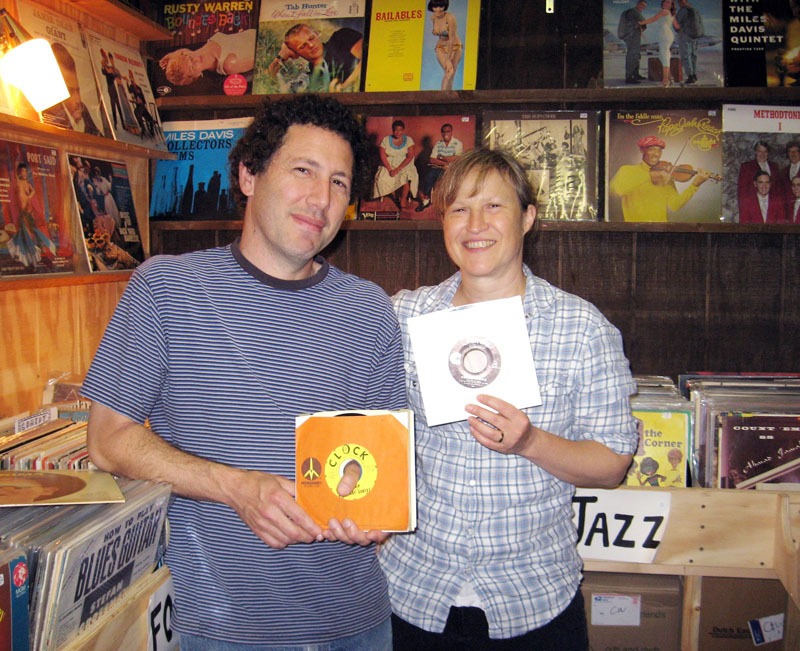 How else to explain the outstanding musical talent that stepped through our doors the other weekend?First, two old friends of ours’, Ira Kaplan and Georgia Hubley of Yo La Tengo stopped in. OK, this wasn’t a total surprise, as they told us they were going to stop by, but it’s always so nice to see them and catch up on old times and new doings. 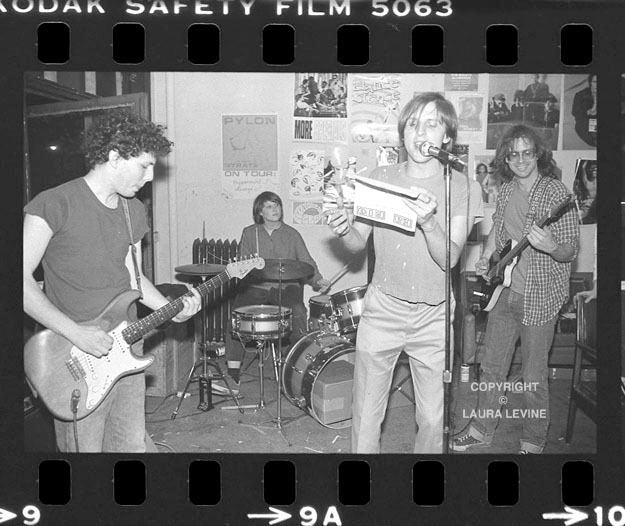 Here’s another – this one’s by me – that’s Ira on the left, Georgia on drums, Managing Editor Glenn Morrow (of the Individuals) on vocals, and Peter Holsapple (of the dB’s) on guitar. It was an annual tradition to host my birthday parties at the Rocker offices – any excuse for a beer-soaked musical free-for-all. The office was on the second-floor loft of a building on on lower Fifth Avenue (166 Fifth). A few ratty sofas and broken metal desks, with an amazing array of records and posters taped up to the walls. All thanks for our editor, Andy Schwartz for making it so homey. As Andy recently pointed out in his blog, most all of our little group still remains friends to this day. Not to go off on too much of a tangent here, but for those of you interested in reading more about my early days as a downtown New York music photographer, here’s a good, thorough read – a three -part interview conducted by Scott Woods of rockcritics.com which really got my brain cells firing on all cylinders as I mined the past to answer his questions. You can also see more of my music photos on my website. OK, that’s just Part One of our rock star weekend! Keep reading to see who came in next…. 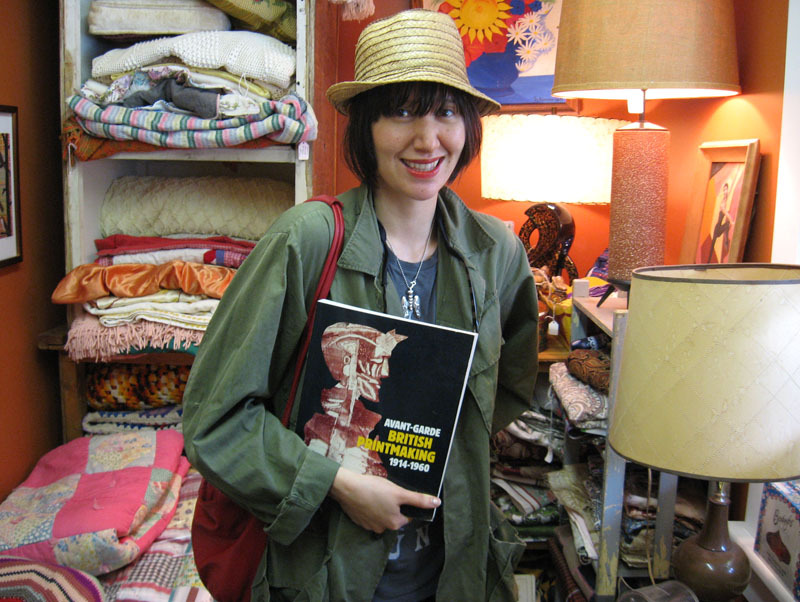 Here Karen O holds some of her purchases: the book Avant-Garde British Printmaking, 1914 – 1960 ($30. ), and the aforementioned old men’s straw fishing hat with netted top ($22.). We can’t think of a more deserving head! 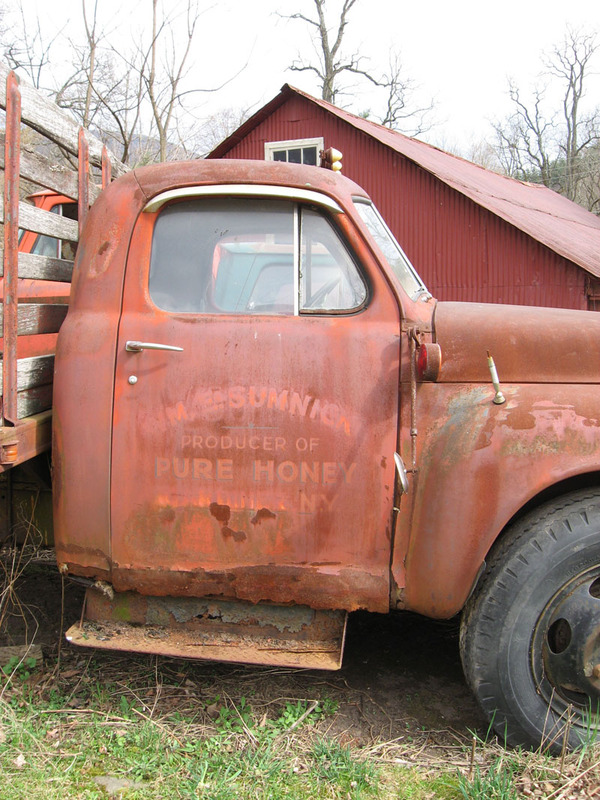 We just can’t help sharing our favorite finds. Here are some of our Favorite Frocks. Enjoy! 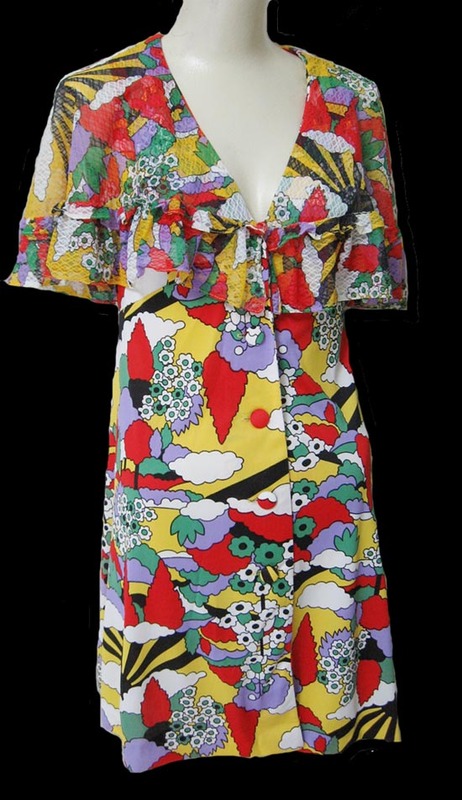 1970's deadstock psychedelic explosion mini dress! Schizophrenic Polka Dot and Houndstooth Mod Concoction! 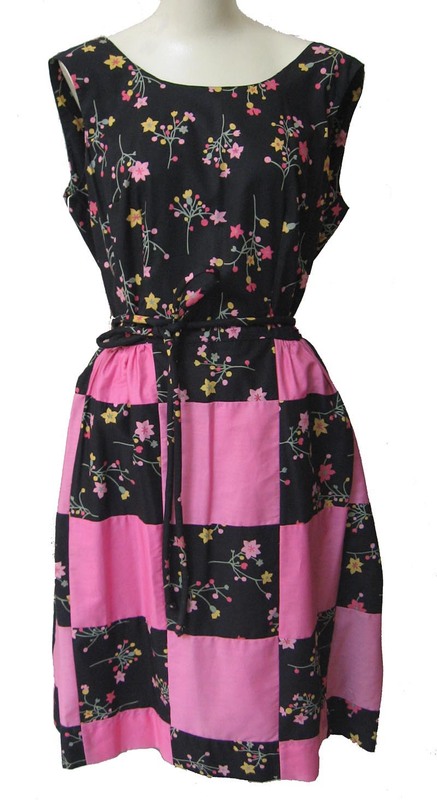 1960's deadstock SWIRL wrap dress, pink and black patchwork. One of the things that makes us proudest of The Mystery Spot is that it’s all-ages. Sure, grown-ups love it here, but so do kids. 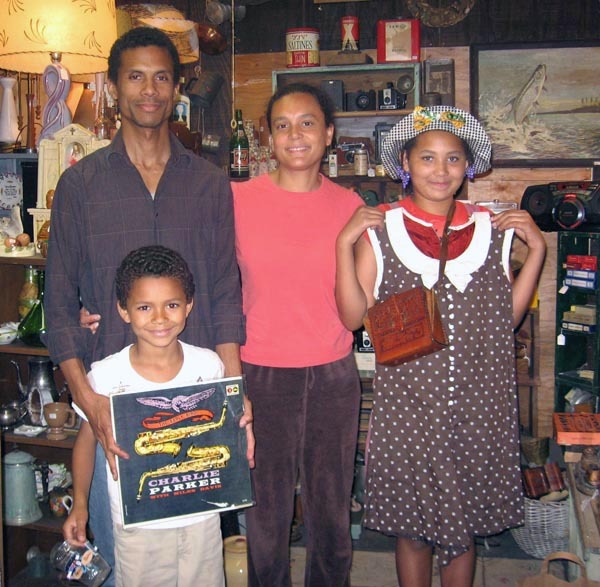 We often get an entire family coming through the door and everyone has a good time as they go off to their respective corners – whether it’s digging through the vinyl, trying on the vintage clothing, reading the weird out-of-print books, or counting the stuffed alligators scattered around the shop (at last count, seven…including the rarely captured Flying Alligator). 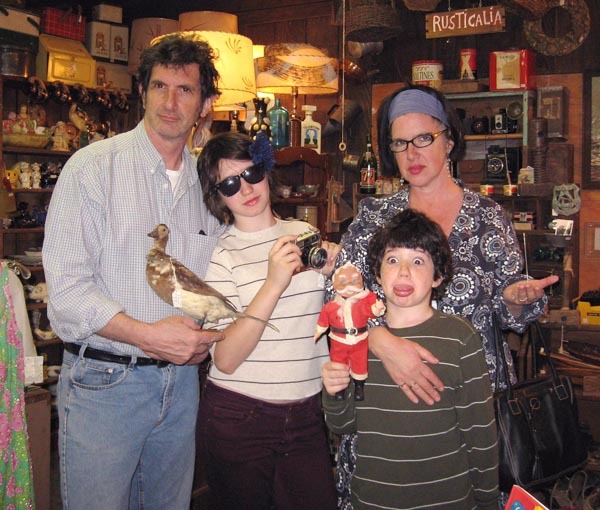 Here are a few of our favorite families who’ve Shopped the Spot in the past month or so….. Sometimes we meet a new customer (or in this case, four of them) and we can’t help but fall a little bit in love with them. This was the case with the Turner-Hansen family. We doubt that when they crossed our threshold they could have imagined spending the better part of their Sunday inside, but so they did. Dad Mark Turner, noted jazz musician, discovered the record room and our bins and bins of vintage jazz vinyl, and well…..that was the last he was heard of for hours, aside from occasionally coming up for air to see what vintage pieces his lovely ten-year old daughter, Kirin, was modeling for him. Mom Helena Hansen, a double-threat psychiatrist-anthropologist, helped Kirin out and also made sure son Ananda (OK, we are officially smitten!) was having fun. Which he certainly was, all 7 3/4 years of him! This photo only shows the tip of the iceberg of the bags and bags of vintage wonderfulness they left with. 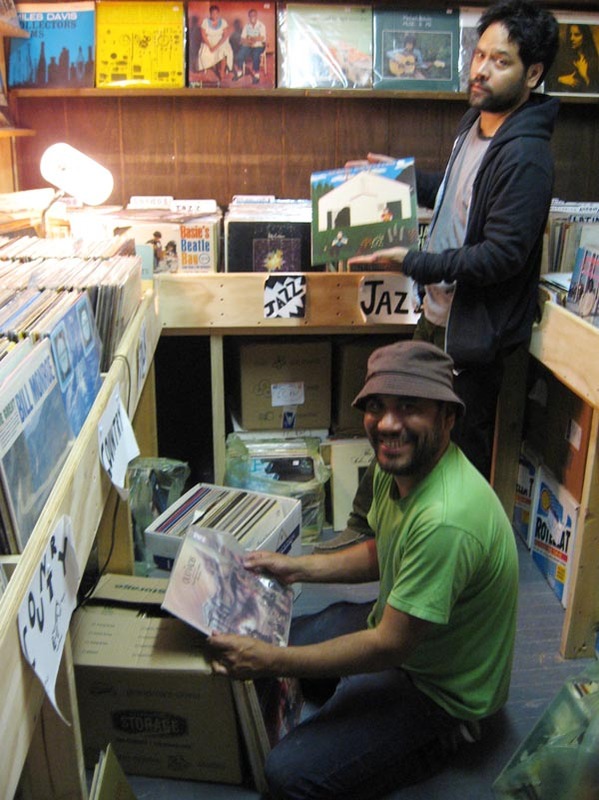 Mark holds one of his vinyl scores, The Early Bird – Charlie Parker with Miles Davis ($20. ), and a Kirin a vintage 1960s brown and white polka dot romper with white collar and buttons ($39.) as well as a killer 1960s hand-tooled leather hippie purse ($35.). We love it when old friends pop in out of the blue to visit and say hello! We haven’t seen Katherine Dieckmann in many a moon, and it was such a joy to see her walk through the door as well as meet the whole gang – husband Brian Wallis, daughter Caroline, and son Nathaniel. We mostly spent our time catching up – Katherine is an acclaimed filmmaker (Motherhood) and teaches screenwriting at Columbia University; Brian is Chief Curator at the ICP, Caroline is beautiful and wise beyond her years, and Nathaniel – well, you can tell from this photo that he’s his own man. Modeled by the brilliant, creative, sophisticated and artistic Wallises, we present the following: one stuffed duck (NFS); one vintage camera ($35. ), a Scary Celluloid Santa ($12.) and an old iron receipt holder ($10.) which Katherine happily took to its new home. You probably recognize the Littletons from previous appearances on these pages, as they are bonafide Friends of the Spot. Elizabeth Mitchell records with Smithsonian Folkways under her own name, accompanied by husband Daniel Littleton and daughter Storey; Liz and Dan also have the band Ida. 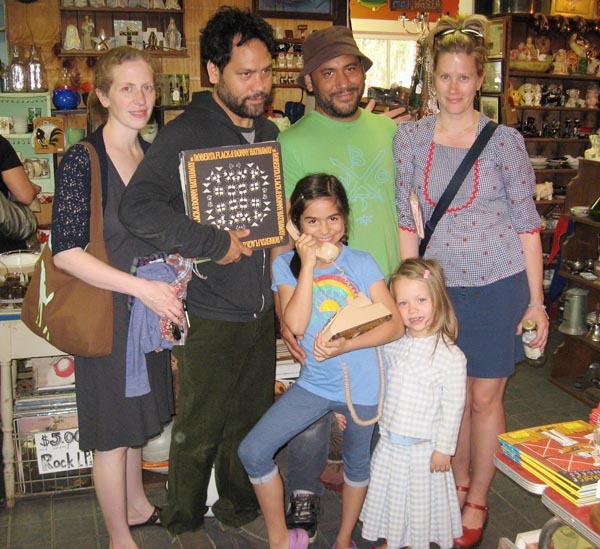 And here’s a bit more of their wonderful extended family – Dan’s brother Miggy Littleton, wife Anna Padgett, and daughter Penny. Are they all musicians you may wonder? (Need you ask?). Penny is three, and she loved this vintage little girl’s baby blue gingham two piece suit ($40.) so much she took it home with her. She loves to play Princesses and likes animal crackers and the Beatles. Her favorite song is Strawberry Fields Forever. Storey is now a Girl Scout! She is bridging into Juniors in June. She’s also an internationally touring rock star who (still) collects elephants and likes to knit and sew. 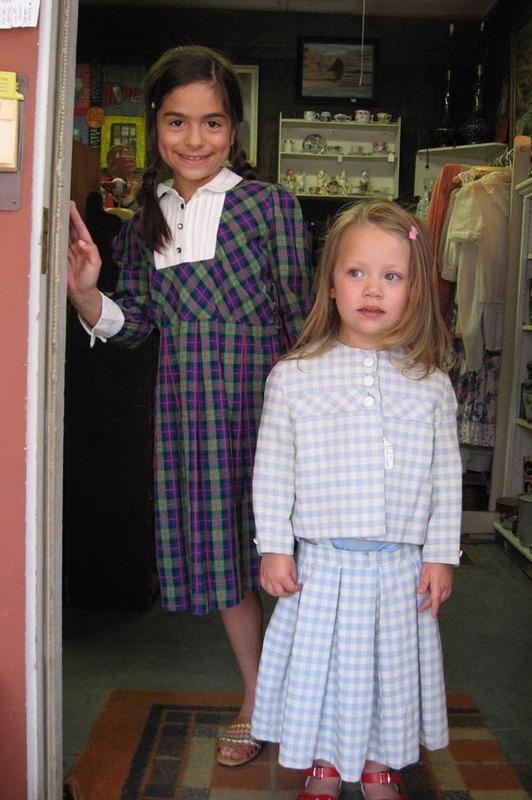 This vintage girl’s plaid dress from the Forties ($15.) went home with her as well. 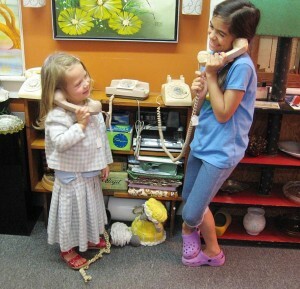 Storey and Penny were quite taken with these old – er, vintage – rotary phones, and one of them came home with them too. Miggy Littleton is a professional record guy (he’s come to our rescue on more than one occasion) and his favorite Beatles song is All Together Now. Here we see Dan and Miggy wallowing in their element. Dig, boys, dig! In fact, in Extended Family News, we’re proud to announce that everyone you see in the family photo – Liz and Dan’s band Ida, and Anna and Miggy’s band The Naysayer, will be performing this summer as part of our free Music for Front Porches series. As of now the date is set for Sunday, August 1, at 1 PM, on our porch, but please do check back or sign up for our mailing list to confirm the date as August approaches. Memorial Day Weekend Estate Sale Finds! 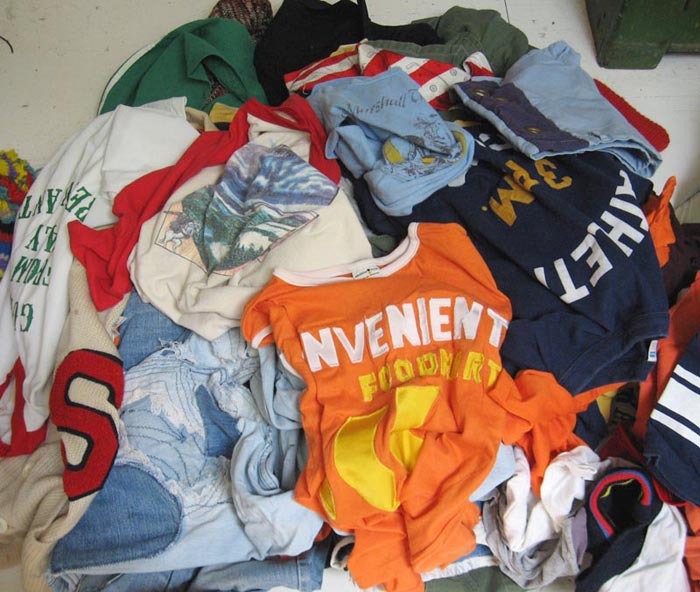 Memorial Day Weekend is the official start of the yard sale season in the Catskills as well as the season opening of the Mystery Spot. It’s a little bit overwhelming but somehow we manage to get out there and comb the sales as well as open our doors to the public. Thank goodness for our kind helpers.And oh, what treasures we found! It’s hard to know where to start, but here are a few of our scores from the Memorial Day Weekend. Most of them will end up in the shop, but we admit a few we may not be able to loosen our grip on. One attic in particular was filled with treasures. 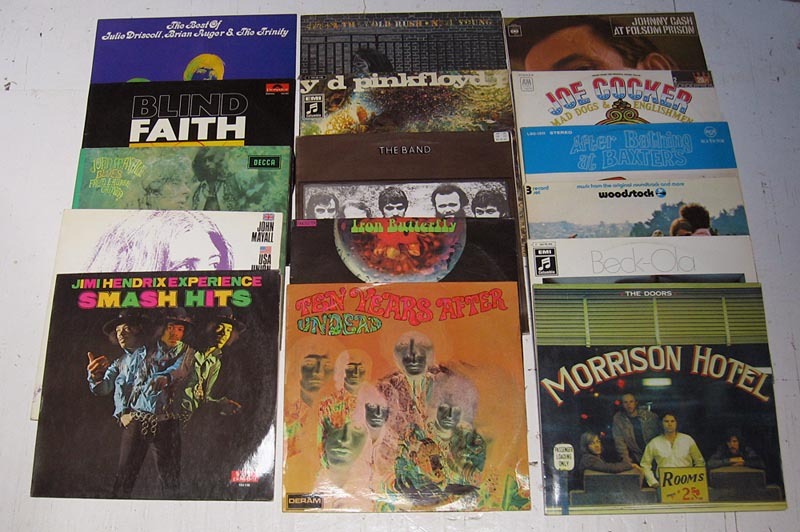 A stash of Sixties German-pressed classic rock records, probably purchased on a U.S. Army base circa 1969. Hendrix, The Doors, Iron Butterfly, Joe Cocker, Woodstock, The Band, Blind Faith – all in jackets just a little bit different than what we’re used to from their American counterparts. 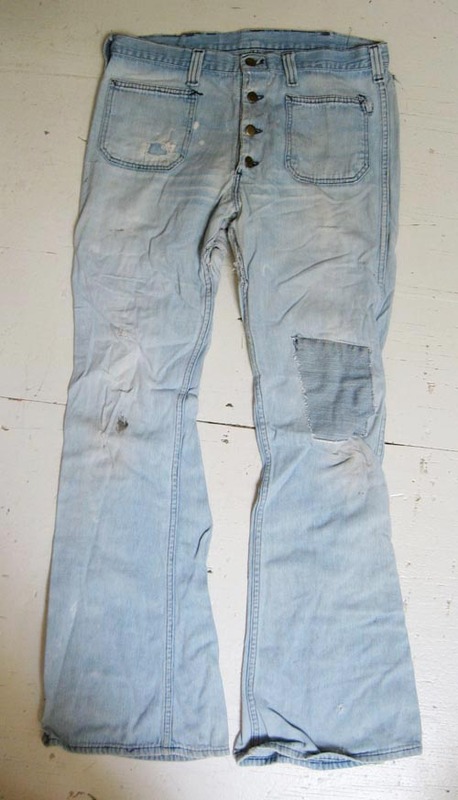 Oh, and did we mention they were near mint? 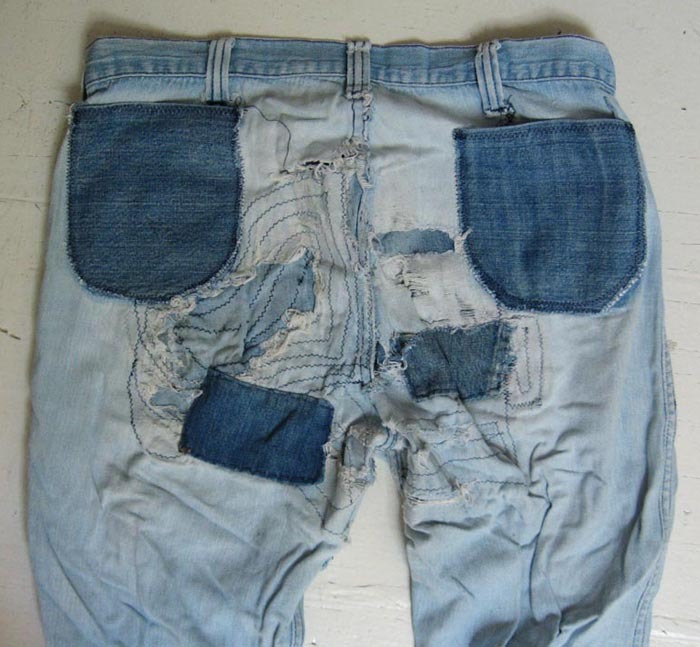 ….and, the piece de resistance…. To cap it all off, here’s one last weekend find – possibly our favorite hat ever. 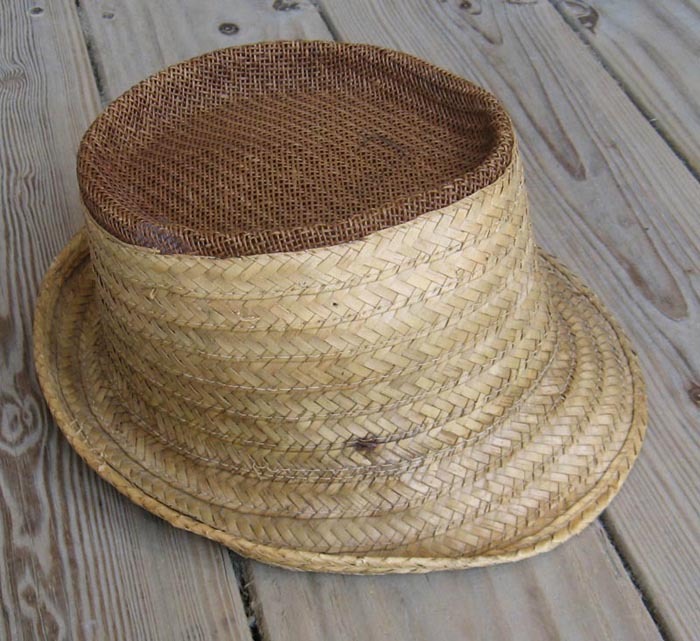 An old straw fishing hat with netted top. HAVE YOU EVER? We love our back yard. 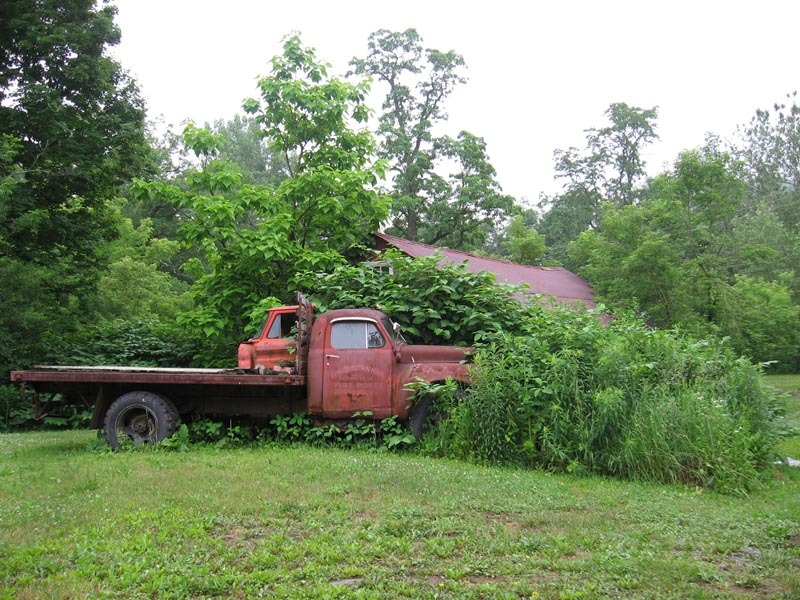 Two old Studebaker trucks and Ray’s red barn. It’s sometimes hard to believe this beautiful tableau is a mere few yards off the bustling Main Street. Woodstockers Stacy, Shane, and Ash Devens have totally figured out how to get the most out of their Mystery Spot dollar. 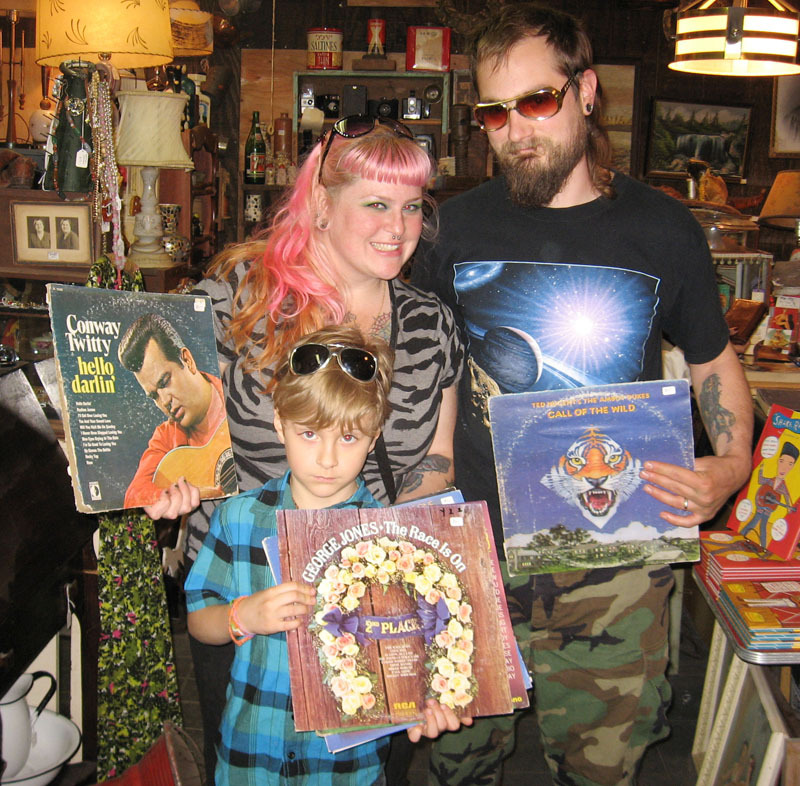 Forget the vinyl room in the back – just hit the dollar record bins on the porch! We’ve said it before – we love it when our friends come to visit! Best buds Laurie Gwen Shapiro and Corey Powell drove up to Phoenicia for the day and after checking out our new location took us out for a delicious lunch at Sweet Sue’s. Laurie is an acclaimed documentary filmmaker whose film Keep the River on Your Right should be in your Netflix queue right now. Corey is the Editor-in-Chief of Discover Magazine, so we know where to turn whenever we have burning questions about the origins of the universe. Laurie fell in love with a vintage 60s ribbed horizontal candy-colored striped dress ($18.) and Corey swears by Phyllis Diller’s Housekeeping Hints ($12.). 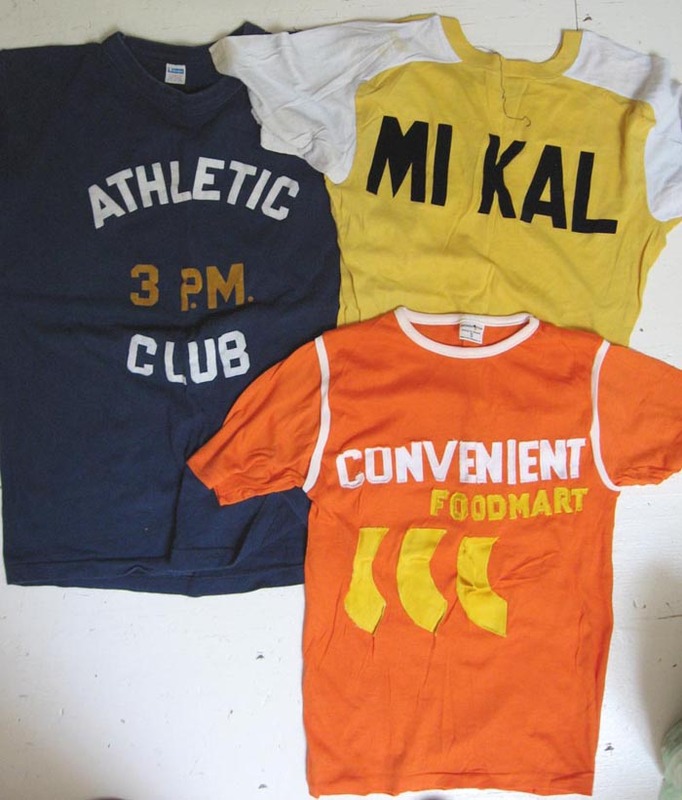 After many years of hoarding, we finally decided to release our stash of vintage T-shirts back into the wild. 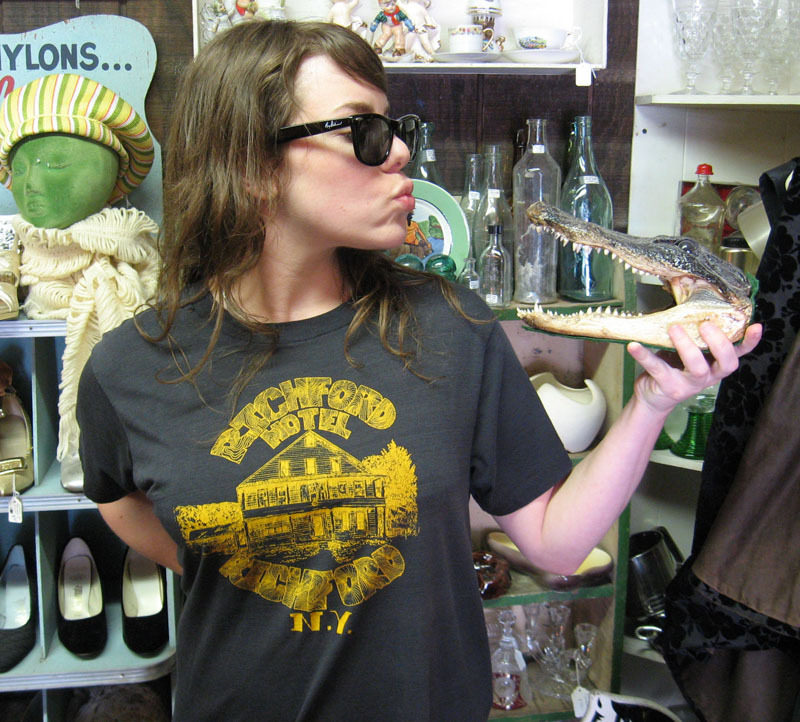 We’ve collected a good bin’s worth (or two) and this 1970s yellow-on-black Richford Hotel, Richford, NY vintage T-shirt ($35.) may just be one of our favorites. Chaya – a hotel housekeeper and professional hamster racer – certainly agreed, and it went home with her. 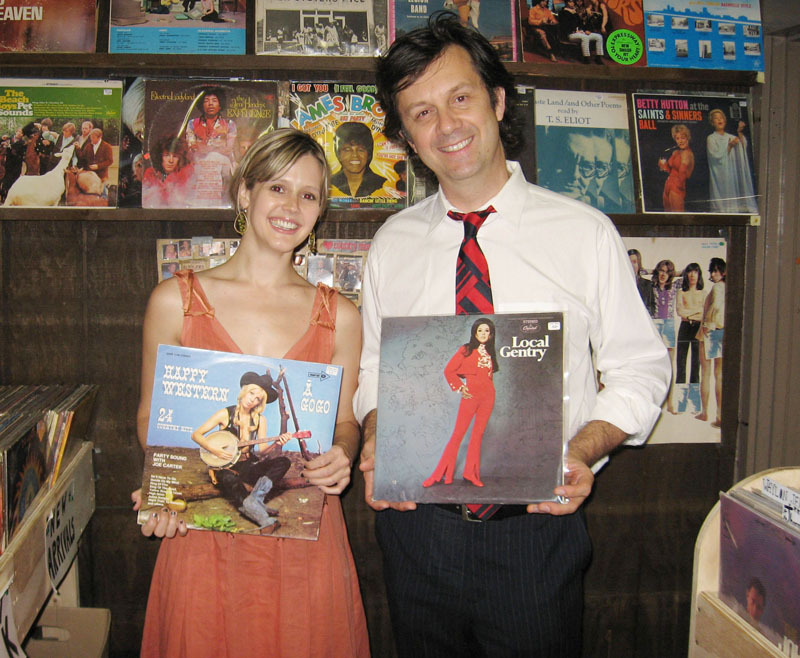 Is it any surprise that two musicians would find themselves in the record room? Multi-instrumentalist Kelly Kyle and guitarist Sean Eden (formerly of Luna, now with the Night People, among other bands) dig the Happy Western A Go-Go and Local Gentry.